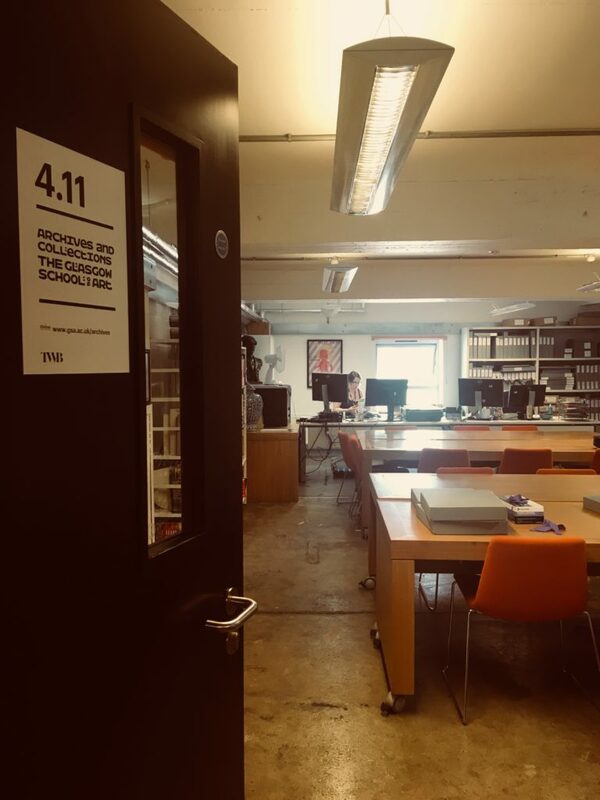 After a period of closure following the fire in GSA’s Mackintosh Building on the 15th of June, the Archives and Collections have now resumed normal service. We can now accommodate visitors again and answer any enquiries that you may have regarding our holdings. To make an appointment or enquiry, please email archives@gsa.ac.uk or telephone 0141 566 1418. To allay any concerns about our holdings, we can confirm that all the archives and collections which were moved out of the Mackintosh Building after the 2014 fire had not been moved back in and are therefore unaffected by the 2018 fire. All of the works made in response to the 2014 fire (including reconstructed Library lights, reproduction furniture and clocks) were also located elsewhere, and are unaffected by the 2018 fire. GSA’s recognised collection of original Mackintosh Furniture was also located elsewhere and has not been affected. Some plaster casts were in the Mackintosh Building but until we have access to the building and are able to undertake a forensic investigation it is impossible to say what has been lost. Many thanks to everyone who has sent messages of support in recent days.